Trump approval rating: how does global public opinion of Trump compare to past presidents? The Pew Research Centre in the US has released its global public opinion report on the Trump presidency – and it doesn’t look good for the real estate mogul turned world leader. Over 37,000 people were surveyed in 37 countries around the world, and of these respondents, 75 percent said they thought US president Donald Trump was arrogant, whilst 65 percent believe he is intolerant. 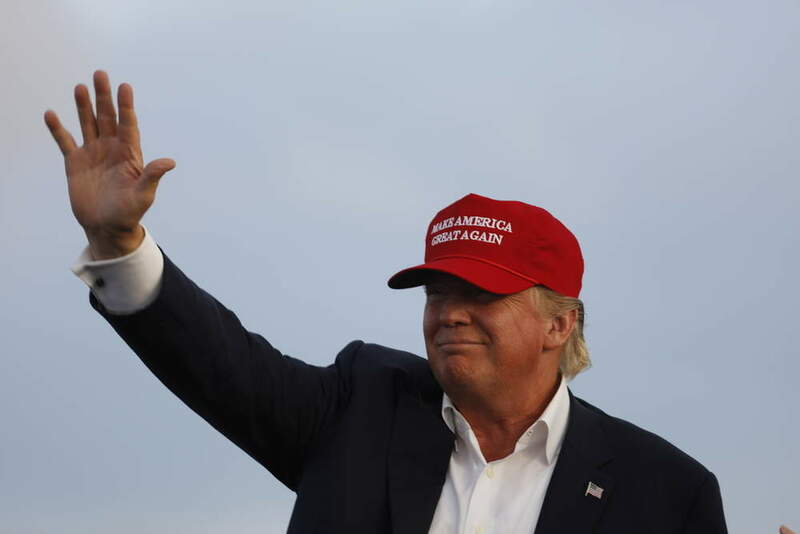 Despite the negative press, however, 55 percent say he comes across as a strong leader. The research centre has been carrying out global public opinion surveys on US presidents since George W Bush was in office in 2003. How does opinion of Trump compare to his two predecessors? By the time Bush Junior left office in 2008, the US image abroad was “suffering almost everywhere”. At the time, the US was mainly blamed for the ongoing financial crisis at the time, and the wars in Afghanistan and Iraq had “driven negative ratings nearly off the charts”. At the start of the Bush presidency, Britain had an 83 percent favourable view of the US, whilst Germany’s view was also fairly high at 78 percent. By 2008, this had fallen to 53 percent and 31 percent respectively. 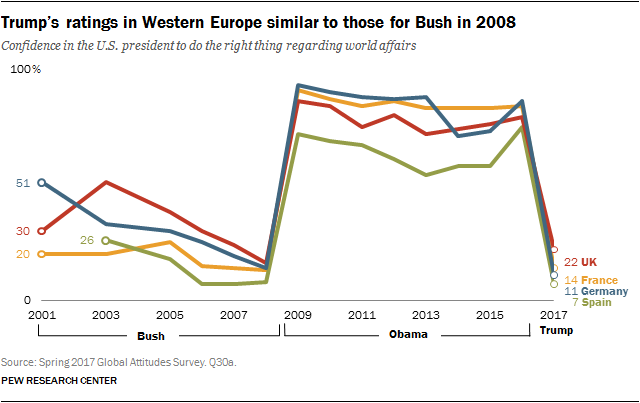 In the 2008 report, the Pew Global Attitudes project asked citizens of 24 different countries across Europe, Asia, the Middle East, South America and Africa whether they thought Bush would do the right thing regarding foreign affairs. Only three countries, India, Nigeria and Tanzania, said they had a lot or some confidence. Global opinion on the US was a very different picture during the Obama presidency. The Democrat had higher international ratings that Bush during his time in the White House, and his election in November 2008 led to a significant improvement in the country’s global image. 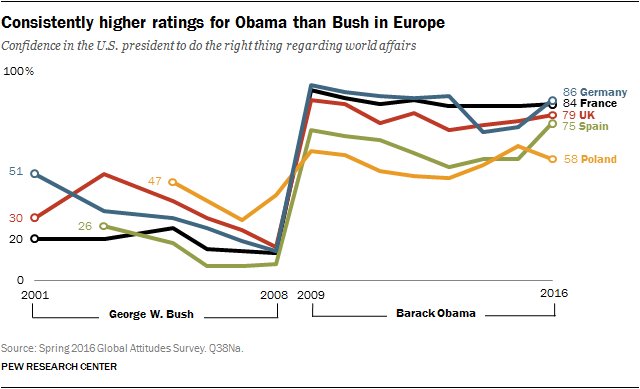 In Europe, 77 percent of respondents said they had confidence in Obama to do the right thing regarding world affairs. As well, in last spring’s Global Attitudes Survey under Obama, over 50 percent or more of every nation polled, except Greece, said they had a favourable opinion of the US. Japan, Poland and Italy all reported back highs of over 70 percent. However, Obama’s ratings fell sharply in Israel in the final years of his time in office. In 2015, just 49 percent of Israelis expressed confidence in the president, compared to 71 percent in 2014. This was down to Obama’s dealing with the issue of Iran’s nuclear program. As well, only 11 percent of Russians expressed confidence in Obama in 2015 – although he never had favourable ratings in Russia really as a result of his handling of the Ukraine crisis. It’s interesting that Russia and Israel polled low ratings for Obama, because they seem to like his successor very well. Around 56 percent of respondents from Israel said they had confidence in Trump to do the right thing globally, a rise of 7 percent from Obama. However, it was in Russia that the most dramatic shift has occurred, with confidence ratings going from 11 percent for Obama to 53 percent for Trump. Overall, global confidence in the US has fallen since the Trump administration. At the end of the Obama presidency, 64 percent of those polled said they have favourable views of the US – but this figure is now down to 49 percent. Confidence ratings gave gone from 64 percent to 22 percent. The president hasn’t been in office for very long, but his major policies have caused discord across the globe. A median of 76 percent across the 37 countries surveyed oppose Trump’s plans to build a wall along the US-Mexico border, one of his flagship ideas. Also, around 62 percent of people disapprove of the Muslim travel ban, something the Supreme Court allowed to go ahead yesterday after six months of court battles. Four countries, Hungary, Israel, Poland Russia, more than half endorse this proposal. 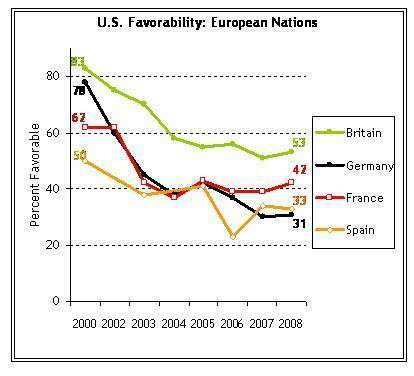 Trump’s global approval ratings in places such as Western Europe are at the same lows that Bush had at the end of his presidency. However, it is worth noting that this was after eight years of Bush’s leadership, whereas Trump’s low ratings are after only six months. Will it get better for Trump? Respondents were asked whether they think relations between their country and the US will improve over the next few years. In general, the prevailing view is that things will stay the same. In Africa, opinion was split fairly equally: 27 percent said stay about the same, 27 percent said it will get worse, and 26 percent said it would get better. This was the most optimistic view about the Trump administration. In Europe, only eight percent said it will get better, compared to around 51 percent who said it will stay the same and 37 percent who think it will get worse. Germany in particular has very low confidence in Trump’s ability to rule. Around 86 percent of the country’s population had confidence in Obama, which has quickly fallen to 11 percent for Trump. But, let’s not write Trump off just yet. There’s at least three and a half more years to go of his presidency, and there could be more after he appeared in Iowa last week in a distinctly campaign-like rally. Going to war with the fourth estate: what threat does Trump pose to the media?